Gross direct tax collections during April-October of the current Financial Year 2013-14 is up by 11.58 percent and stood at Rs.3,37,907 crore as against Rs.3,02,844 crore in the same period last year. While Gross Collection of Corporate taxes has shown an increase of 8.23percent and stood at Rs.2, 09,622 crore as against Rs. 1,93,679 crore in the same period last year Gross collection of Personal income tax is up by 17.89 percent and stood at Rs.1,25,078 crore as against Rs. 1,06,097 crore in the same period last year. 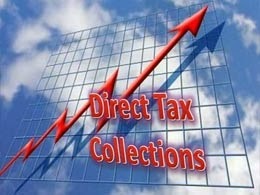 Net direct tax collections is up by 13.33percent and stands at Rs. 2,84,339 crore, as compared to Rs. 2, 50,900 crore in the same period in the last fiscal. The collection of Securities Transaction Tax (STT) stands at Rs. 2,645 crore showing the growth of 5.67percent as compared to collections made in the same period in the last fiscal. The Wealth Tax has posted a growth of 5.86 percent and stands at Rs. 560 crore as against Rs. 529 crore in the same period last year.